...but because of the way it displays their complete ignorance of what science tells us about human beings. Quite simply, in all my years as an engineer, doing scientific research, I have never come across a study or research paper which provides evidence for the claim that a human child is "full of wonder" or "beautiful". You will be hard pressed to even find the use of this language in your average scientific paper. 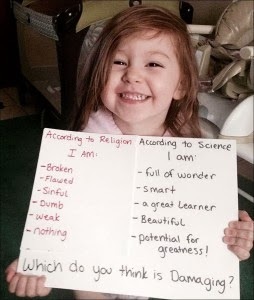 I wish I could ask the parents of this child, which are obviously filling her head with these erroneous views, what is the unit measure for "awe" or "beauty"? How many of these does a flower have over a Monet painting? How many "wonder units" will trigger that most common of all toddlers questions..."why?" The mistake this meme makes is that statements such as "you are beautiful" or "I'm full of wonder" are by their very nature philosophical. Science can say very little about wonder and the capability to appreciate beauty other than perhaps explain the neurological effects these unique human experiences have in the brain. The most we should expect from science is to explain the "how" of these experiences. To find the "why", why a child is beautiful and why it is full of wonder, we need more than science, we must turn to philosophy which tells us that man is much more than a collection of its own electrochemical and mechanical parts. Philosophy points towards a greater reality, spiritual and eternal. It is this reality which orients us towards what is true and beautiful. Religion just provides context to these philosophical ideas. Why can we say we are are filled with wonder? Because we were created for this purpose. To be attracted to truth and beauty. Why are we attracted to truth and beauty? So that we can find out our true destiny, our place in creation. We are oriented towards that which is eternal. This is what the true religion has to tell about us; that we are created with a deep need for truth, and we can only find this truth when we find the Creator. Up to now I have been focusing on the right side of the meme. Let me address the left side. Often secularists portray religion in a rather pessimistic (almost Calvinistic) way. They think that religious people suffer from a horrendous case of self loathing. This is clearly evident on the list of what religion supposedly says about a young child. The problem with this view is that ignores one of the fundamental teachings of the Bible about human beings. So you see, religion exalts the human being, but for science, humans are just another subject matter. I hope this presentation helps dispel the erroneous ideas this little meme is propagating.